Scholes is a village in Leeds, West Yorkshire, England. Its name is a plural of Old Norse skáli meaning "temporary shed". It is sometimes known as Scholes-in-Elmet to distinguish it from the villages of the same name in the Holme Valley and Cleckheaton, also by analogy with the neighbouring village of Barwick-in-Elmet and Sherburn-in-Elmet. The village is part of the civil parish of Barwick in Elmet and Scholes, sits in the Harewood ward of Leeds City Council and Elmet and Rothwell parliamentary constituency. In 2001, the population of Scholes was 2,403. In the 1800s, Colonel Frederick Trench-Gascoigne (of Parlington Hall, Aberford) owned and rented out a large number of houses, mines, woodlands and farming land in the areas of Scholes, Swarcliffe, Barnbow, Garforth, Barwick-in-Elmet, Cross Gates, and Whinmoor. In the mid-1880s, a previous occupant of the Seacroft windmill, Isaac Chippindale, started the Scholes Brick and Tile Works on Wood Lane, on the border to Swarcliffe. The company's quarry produced high-quality bricks with which many houses in the surrounding area were built. Its kilns and house were demolished in the early 1980s, leaving two small fishing lakes, but is still known as "Chippy's Quarry". Scholes has several shops including a convenience store and off-licence, two pubs, a library and two churches. The nearest commercial centres are in Seacroft and Cross Gates. The Seacroft Green shopping centre contains amongst other shops a large Tesco supermarket, while the Cross Gates Shopping Centre (formerly an Arndale Centre) contains many high street shops. Other nearby commercial centres include Garforth and Wetherby. The Barley Corn is a historic Samuel Smiths pub on Main Street, while the former railway station on Station Road (The Buffers) has been converted into a pub and restaurant. Scholes lies close to the Leeds Outer Ring Road, the A64 and the M1. Opened on 1 May 1876, a rail connection owned by LNER (London and North Eastern Railway) ran past the eastern border of Swarcliffe and Stanks, which was a part of the Cross Gates to Wetherby line. In 1965, services were withdrawn as part of the Beeching Axe; an informal name for the British Government's attempt to reduce the cost of running British Railways in the 1960s. Local bus services are 64 and 11, provided by First Leeds. 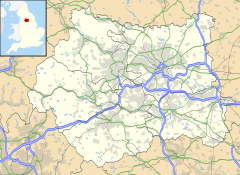 The nearest international airport is Leeds Bradford Airport, which is 12.4 miles (20 km). Scholes is in the LS15 postcode area. The climate in Scholes is moderate. ^ "SCHOLES (West Yorkshire, Yorkshire and the Humber, Great Britain)". City Population. Retrieved 2 August 2011. Hull, Brian. "The Gascoigne Mines in Garforth". Parlington Hall Website. Retrieved 4 August 2011. Colman, F. S. (1908). "A History of the Parish of Barwick-in-Elmet in the County of York". Barwick-in-Elmet Historical Society. Retrieved 2 August 2011. ^ "Isaac Chippindale & Sons, brick and tile manufacturers". The National Archives. Retrieved 4 August 2011. ^ Marshall, Nigel. "The Chippindale Family". pro-patria-mori. Archived from the original on 28 March 2012. Retrieved 4 August 2011. ^ Cox, Tony. "The Leeds - Cross Gates - Wetherby Railway". Barwick-in-Elmet Historical Society. Retrieved 4 August 2011. ^ "The Development Of The Major Railway Trunk Routes". Railways Archive. Retrieved 28 July 2011. ^ "Welcome to First in Leeds". FirstGroup plc. Retrieved 2 August 2011. ^ "Leeds Bradford International Airport". Leeds Bradford International Airport Company. Retrieved 2 August 2011. ^ "Climate info for Scholes" World Weather, 30 July 2011, web: worldweatheronline.com. Wikimedia Commons has media related to Scholes, Leeds. This page was last edited on 15 December 2018, at 22:20 (UTC).